2 CDs & 64 pages of recipes, photos and travel adventures. 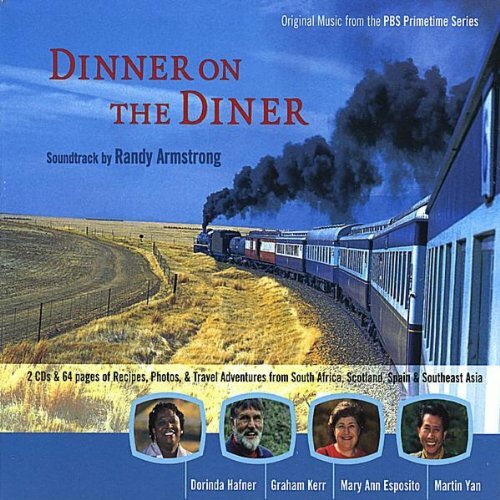 This double CD soundtrack features the music composed, arranged and selected by Randy Armstrong for the four-part PBS series, "Dinner on the Diner," produced by British filmmaker, Jon Guilbert. This series is about four famous train routes in South Africa, Spain, Scotland and Malaysia/Thailand. 15. Variation on "Khamen Sai Yok"
Elegant dining, elegant music: that's the idea behind this intriguing package, a two-CD set featuring the music accompanying the PBS prime-time series Dinner on the Diner. The series features famous chefs whipping up delicious meals as their train speeds through Spain, Scotland, South Africa, and Southeast Asia. 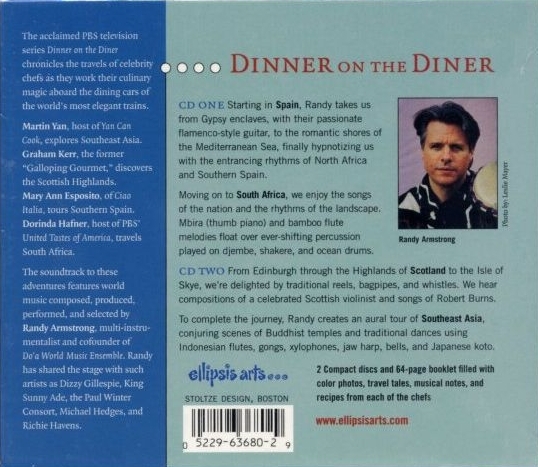 Composer Randy Armstrong was given the task of writing music true to each of these cultures. Cofounder of the Do'a World Music Ensemble, Armstrong has a collection of more than 200 instruments from around the world. By utilizing his own playing experience and carefully researching the indigenous music of the respective countries, Armstrong has put together a respectful and pleasant soundtrack, each section reflecting a distinct region. The colorful booklet details each of the musical pieces--how they originated and how they sync up with the visual images--and even includes recipes. The music is both suggestive and unobtrusive. It can stand on its own, though, and will serve as a pleasant reminder of the series itself. Its safe, mildly exotic sound perfectly mirrors the cloistered realm of a dining car traveling through wild lands. If only music could smell of good cooking, this lovely set would make your mouth water... evocative... timeless... spicy... This international musical journey is tantalizing -- the perfect gift for your favorite cook."